New to CallRail? Don't get lost in translation. There's no lack of buzzwords when it comes to call tracking. We use dozens of terms to describe our intuitive and powerful call analytics that are trusted by more than 100,000 businesses around the world. Not sure what "Call Intelligence," "Dynamic Number Insertion," or "Keyword Tracking" mean for your business? We're here to help. The following glossary is your reference point for all of the language we use at CallRail. Abandoned Call - A call is considered "abandoned" if it is unanswered and it ends less than 15 seconds after it was placed. When that happens, it is likely the recipient's phone did not have time to ring and the caller did not intend to connect to the business. Account Center - A hub inside of a CallRail where you can use a single login email address to access multiple accounts. When Account Center is set up, you’re able to quickly and seamlessly switch between CallRail accounts you have access to once you've confirmed your access to your other accounts. Activity - This tab contains all of the activity for your CallRail account. Here, you'll find your call log, text message history, and all form submissions. This data can be filtered to access granular information about the activity on your account. Google Ads - Google’s online advertising program that allows you to place different kinds of advertisements around the web. CallRail accounts can be integrated with Google Ads to track your calls as conversions. Agents - In CallRail, an Agent is a user that can receive call assignments. Any call flow where an agent name is listed as a destination will report the call under that agent's name in the call log. Only agents can use Callrail's softphone feature. API - The Application Program Interface is a set of protocols and tools that can be used to programmatically access and modify the data in your CallRail account. It is intended for developers and customers looking to integrate custom software directly with CallRail. Billing - Billing and up-to-date invoice information are available to any administrator on a CallRail account. Account administrators can also choose to receive monthly invoice emails. Blocked Callers - This feature allows you to block and prevent phone numbers from calling or texting companies in your account. Blocked calls and text messages will not appear on your reports. Call Flow - The process a caller goes through from the moment they first dial your number to the moment they hang up. CallRail’s powerful Call Flow Builder allows you to allows you to create unique, fully customizable call flows for each of your tracking numbers. Call Intelligence - CallRail's growing call intelligence suite includes CallScribe and CallScore. These tools use automation and machine learning in order to transcribe and categorize calls to your business. Call Monitoring - A feature that allows you to listen to active calls within Lead Center. As you monitor live calls, you'll remain muted; however, you can add notes, tags, and classify the call while monitoring it. Call Notifications - CallRail can send you custom notifications about specific interactions with calls, like missed calls, voicemails, first-time callers, or calls matching a specific tag. These notifications can be sent via email, text or desktop alerts. Call Recording - A feature that allows you to automatically record phone calls received by your tracking numbers. After a call ends, the recording will be available to replay in your call log and email notifications. CallScore - The CallScore feature allows your calls to be classified as leads depending upon on criteria specific to the industry and calls you serve. CallScore automatically scores and transcribes each incoming call to a company based on machine learning models that have been built, created and tested for accuracy. This feature is available at no additional cost for all CallRail pricing plans. CallScribe - The CallScribe feature allows you to read entire conversations between your team and customers by transcribing your calls. Available in the caller's timeline, you can snap to important points in the conversation by clicking on the call recording's waveform and read the entire call transcript without having to listen to the call. CallScribe is an optional add-on available for $0.025/minute on the Starter plan, and for $0.02/minute on the Pro plan and higher. Cancel - CallRail accounts can be closed at any time. When a CallRail account is canceled, all tracking numbers are immediately released and calls will no longer route to your business. Challenge Calls - Challenging a call will prompt the caller to press 1 to complete the call, which helps confirm that a caller is a person, not a robodialer. You can set certain tracking numbers to challenge calls, including ones that aren't currently assigned to a website visitor. Companies - Any organization that requires separate access to call tracking reports. You can create company-specific user accounts so that stakeholders can access only the reports pertinent to their business. Every CallRail account supports unlimited company accounts. Company Summary Email - Company Summary emails provide a breakdown of call activity for companies within your account. You can choose the data presented in your email, including total calls to a company, total minutes used by a company, as well as statistics on new callers, keywords, and sources driving calls to your business. You can choose to receive these emails on a daily, weekly, and monthly basis. Destination Number - The number where the phone will ring when customers dial your tracking number. This is typically your primary business phone number. Destination numbers can be updated at any time without interfering with call routing. Dial Step - A step in the Call Flow Builder that routes callers to a single phone number, Agent, or SIP address. Dial steps are typically used in conjunction with greetings and menus. External Query - The External Query step in the Call Flow Builder allows you to set custom rules as to how your calls should route. For example, if you'd like a repeat caller to route to your support team, and a new caller to route to your sales team, you can build an external API that tells CallRail how to route the call. This is an advanced configuration for the Call Flow Builder, and should only be implemented by a developer. Filters - CallRail's filters allow you to pick the type of calls you'd like to display on your activity dashboard or in your reports. These filters allow you to access granular data about your calls so you can see the most pertinent data set no matter which filters you'd like to use. You can also save your filters to easily find calls that fit specific criteria at any time. Form Tracking - The Form Tracking feature allows you to immediately follow-up with prospects that contact you through a form on your website. Each time a customer fills out a form on your website, CallRail captures the contents of that form and instantly alerts you by phone call, text message, or email. Form Tracking Alert - You can choose to receive a call, text message, and email alerts when someone submits a form on your website. When you receive a phone call alert, CallRail reads the contents of the form to you, then give you the option to immediately call the customer back at the number they provided. Geo-Routing - A feature in the Call Flow Builder that allows you to automatically route callers to the business location closest to them. If you choose to route by area code, CallRail will detect the caller's area code and route them to the location you delegate in the Call Flow Builder. Greeting -A greeting is an audio message that plays to the caller before their call is connected. Greetings are often used in conjunction with call recording to announce to callers that their call will be recorded. Hang Up - The hang up step in the Call Flow Builder will automatically disconnect your call. Hubspot - A CRM, marketing and sales tool that helps companies organize, track and grow their pipelines. CallRail’s Hubspot integration gives you rich information about your callers and allows you to segment and score leads based on their calls and text messages to your business. HubSpot is a premium integration available to customers on the Pro or Elite pricing plan. Integration Triggers - You can use CallRail's integration triggers to customize how your call data reports to third-party analytics software. This allows CallRail to filter out data to your integrations according to specific rules that work best for your business. Keypad Scoring - The Keypad Scoring feature allows you to enter valuable information about a call as soon as it ends. After each call, a brief automated survey gives you the option to score the call as a lead, add a tag to the call, and record a value for the call. Keyword Spotting - The Keyword Spotting feature allows you to tag and score calls based on specific words said by the caller or agent on any given call. With Keyword Spotting, you can target specific keywords to measure customer satisfaction, understand the context of a call without listening to a recording, and further streamline your process of categorizing and scoring calls. Keyword Tracking - The process of assigning a phone number to a single visitor of a website in order to correlate calls to visitors and track which sources and keywords are driving phone calls. CallRail allows you to create a pool of telephone numbers that belong exclusively to your business for keyword tracking. Lead Center - CallRail's standalone application where you can access your calls in real-time, as well as your text messages, call monitoring, and Softphone. Access in-depth information about your customers as you receive calls. Menu - The menu step in the Call Flow Builder allows you to prompt your callers to press a number on their keypad to route to a specific person, department, or team. Multichannel Attribution - A feature that gives you a better view of the caller's interaction path that lead to a phone call, including every source and page view that lead to a conversion. Multichannel Attribution is only available to accounts using keyword tracking. Outbound Caller ID - The number that appears on a recipient's phone when you dial their number. You can customize which number appears when you make a call from any of your tracking numbers. In order for a non-tracking number to appear on the caller ID of the person you’re dialing, you'll first verify that you own that phone number. Podio - A web platform designed to help organize team communication, business processes, data and more. CallRail’s Podio integration allows you to create specific tasks according to incoming calls and text messages. Porting - The process of transferring an existing phone number from one provider to another. Phone numbers can be ported from a provider into CallRail or from CallRail to another provider. Quick Texts - The Quick Texts feature lets you create reusable text messages to quickly send to your customers. Use Quick Texts to respond to missed call with a text message, or to send appointment reminders and promotions without having to generate a new message each time. Reports - The Reports tab gives you a detailed breakdown of where your callers are coming from, how often they are calling, and whether or not it is their first time calling your business. This data can be filtered to access granular information about the calls coming into your account. Report data can also be printed or exported as a CSV file. Round Robin - A feature in the Call Flow Builder that allows you to sequentially route phone calls to multiple destination numbers in a queue. You can set a specific amount of time that each number in the queue should ring before moving on to the next number. You can also use CallRail’s Round Robin feature with a weighted distribution, so certain destination numbers take calls more often. 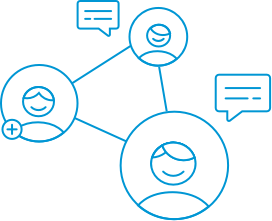 Salesforce - A CRM that lets you manage contacts and track opportunities. CallRail’s Salesforce integration allows you to fully customize how your call activities report to Salesforce. Salesforce is a premium integration available to customers on the Pro or Elite pricing plan. Setting up CallRail's Salesforce integration. Schedule - A feature in the Call Flow Builder that allows you to route calls to certain agents or departments based on your company’s business hours. This is commonly used by agencies who route calls to their office during the day, but a call center or a voicemail after hours. Settings - The Settings tab is where you will find all of CallRail's integrations including Google Ads and Google Analytics along with our full suite of intelligence features like CallScore and CallScribe. The settings tab is also where you can customize any of the email summaries or alerts we send for your account. You can also configure blocked callers, call tags, keypad scoring and more here. Simulcall - A feature in the Call Flow Builder that allows multiple destination numbers to ring simultaneously when someone dials your tracking number. The first destination number to answer the call will be connected to the caller, while the rest of the connection attempts are canceled. Softphone - An in-browser phone system that allows you to place and answer calls without picking up a phone. Using Softphone inside of CallRail allows you interact with and score your calls in real-time. Source Tracking - The process of assigning a phone number to a single campaign in order to track all of the calls that come from that source. Source tracking numbers can be used directly on offline marketing collateral or with CallRail dynamic number insertion to easily add your call tracking number to your website. Tags - Call tags allow you to easily sort and categorize your calls. Each company in your account has its own set of customizable color-coded tags. Tags can also be used as part of your Call Flow. Text Conversation - Any one to one chat conversation over a 24-hour period between 12 AM and 11:59 PM. CallRail uses text conversations as a way of grouping and displaying text message data. Each day’s conversation will exist separately from one another. Only local U.S. and Canadian tracking numbers are able to send and receive text messages. Text Message - A single message sent to or a from a phone number. CallRail’s interface allows you to send and receive text messages from any of your registered tracking numbers on both the website and CallRail mobile app. Text Message Notifications - CallRail can send you custom notifications whenever a text message is sent to one of your tracking numbers. These notifications can be sent via email, text or desktop alerts. Tracking Number - A unique phone number that when dialed allows you to monitor, record, automatically transcribe and score phone calls to your business. Your tracking number will forward to a different number that you already own. User - Specific persons or teams that you can add to your account to view and interact with your call data. Different user types have different privileges, like login access, as well as editing and creating tracking numbers and settings. Voicemail - A digital inbox for recorded messages left by your callers. You can create a custom voicemail in CallRail’s Call Flow Builder that will override the voicemail on a destination number when a call is received by a tracking number. Voicemails can also be transcribed in CallRail for $0.40/each. White Label - The White Label feature allows agencies to present their own brand to a client. With white labeling, all CallRail branding is removed from an account and clients access the account via a custom subdomain with a different name and logo. How to white label your account in CallRail.